The website, www.thetruepicture.in, according to whois.com — a domain registration and hosting service provider — was registered last year. It shares its landline telephone number with BlueKraft Digital Foundation, which is the “technology and knowledge” partner to Exam Warriors, the latest book authored by Prime Minister Narendra Modi to help children fight exam stress. The website, http://www.thetruepicture.in, according to whois.com — a domain registration and hosting service provider — was registered last year. The Indian Express visited the address in Connaught Place mentioned on BlueKraft’s website where two individuals said that they work for BlueKraft but did not run any website by that title. As per Registrar of Companies Records, BlueKraft Digital Foundation was founded by Hitesh Jain and Rajesh Jain in 2016. Rajesh Jain, a technology entrepreneur was involved in Narendra Modi’s campaign for the 2014 Lok Sabha elections. He has also served as a part-time member in the Unique Identification Authority of India. BlueKraft’s founding CEO is Akhilesh Mishra, another member of Modi’s 2014 election campaign. Before joining BlueKraft, he served as content director of MyGov.in, the Centre’s citizen engagement platform. Most recently BlueKraft was the technology and knowledge partner of Modi’s book, Exam Warriors. The company also published a book about Modi’s monthly radio broadcast, Mann Ki Baat, calling it a “social revolution on radio”. Mishra, when contacted by The Indian Express, denied that BlueKraft had any relation to The True Picture. “We don’t run it,” he said. Rajesh Jian did not respond to calls and a text message sent to his mobile phone. 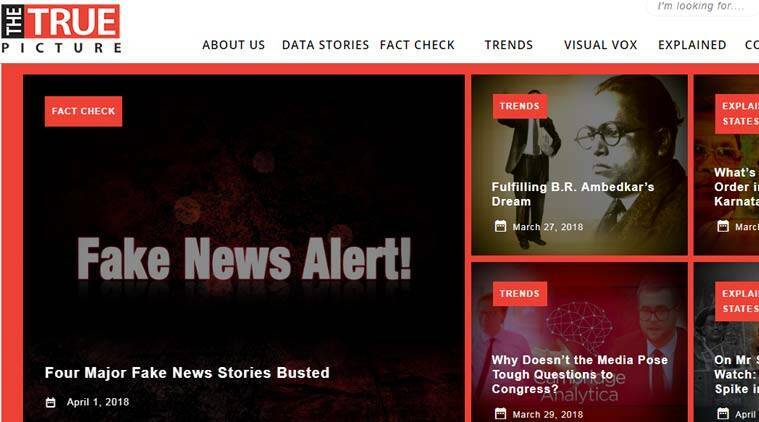 Of the four reports mentioned in The True Picture article titled, “Four Major Fake News Stories Busted,” the website called two by The Indian Express fake. Both these reports in The Indian Express were based on official documents — an FIR and notes written by the Foreign Secretary and the Cabinet Secretary. What it calls fake: FIR lodged by Pradeep Rathod’s father says accused No 1 & 2 threatened to kill his son for riding a horse. One was a report about a Dalit man murdered for owning a horse. The Indian Express has a copy of the FIR filed in the case which quotes the father. In the second report about the government asking senior functionaries to skip a Dalai Lama event stating that it was a “very sensitive time” for Indo-China relations, The Indian Express quoted the letter written by the Cabinet Secretary to top bureaucrats asking them to avoid the event. Rathod’s father Kalu, a farmer, had said, “…I bought him one around eight months ago. But people from the upper caste couldn’t stand him riding a horse and started threatening us.” The Indian Express report had also mentioned that Bhavnagar SP, Pravin Mal, said that “prima facie, the victim riding a horse led to his death”. The website refers to a second report by The Indian Express to claim a “false narrative promoted by the media that the government had ‘surrendered’ to China by asking its ministers and officials to stay away from events honouring the Dalai Lama”. According to the website, on March 31, when the ‘Thank You India’ event “actually took place, to mark 60 years of the arrival of Dalai Lama in India, it was seen that Union Minister Dr Mahesh Sharma along with Ram Madhav, National General Secretary of the BJP, participated”. Not only did the BJP leaders attend the event, The True Picture said, “but they also rather strongly and emotionally stood by the Tibetan community”. This refers to a March 2 report by The Indian Express, which had said that a note dated February 22, was sent by Foreign Secretary Vijay Gokhale to Cabinet Secretary P K Sinha. 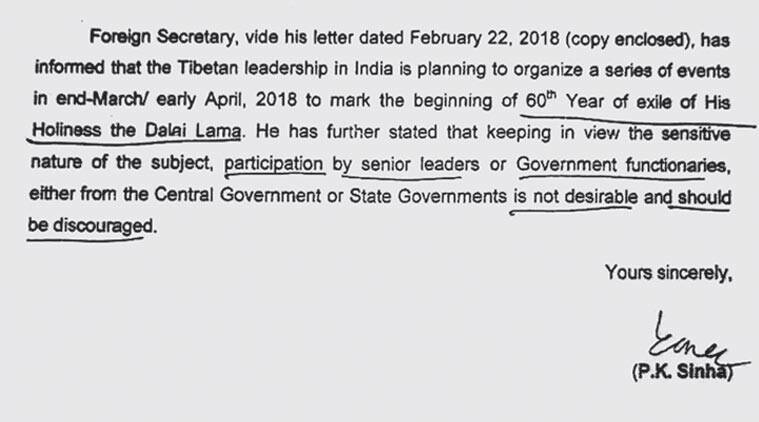 Four days later, Sinha put out a directive telling “senior leaders” and “government functionaries” of the Centre and states that it is “not desirable” to participate in the events of the Tibetan leadership in exile. China calls the Dalai Lama, the spiritual leader of the Tibetans, a “splittist” and a “dangerous separatist”. In his note to secretaries and heads of government departments, Sinha said participation in these events “should be discouraged” and “accordingly, you are requested to ensure appropriate action in the matter”. He quoted Gokhale’s note to underline “the sensitive nature of the subject”. Among the Ministers who tweeted the link to the website are: Piyush Goyal (Railways and Coal), Smriti Irani (Information and Broadcasting), Radha Mohan Singh (Agriculture), Prakash Javadekar (Human Resource Development), Birender Singh (Steel), Thawarchand Gehlot (Social Justice and Empowerment) and Union Ministers of State Kiren Rijiju (Home), MJ Akbar (External Affairs), Rajyavardhan Rathore (Information and Broadcasting), Vijay Goel (Parliamentary Affairs), Babul Supriyo (Heavy Industries and Public Enterprise), Pon Radhakrishnan (Finance) and Arjun Ram Meghwal (Parliamentary Affairs). 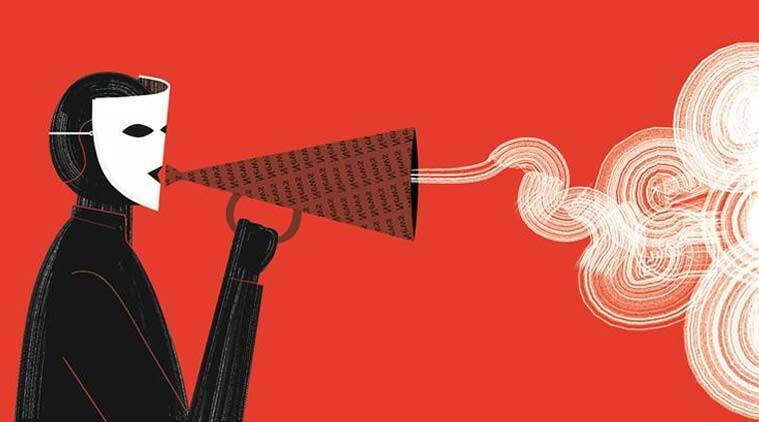 Responding to the report ‘Look who is busting fake news for 13 Ministers: site with Exam Warriors link’ (April 3), Rajesh Jain, co-founder of BlueKraft Digital Foundation, has written saying, “I am no longer associated with BlueKraft. I resigned a few months ago. I have also resigned as part-time member of UIDAI and as Independent Director, NTPC. All these were done in October 2017 prior to my launching Nayi Disha (https://nayidisha.com), a political platform to make Indians prosperous. To therefore bring my name into the story is wrong.” On the mention in the report that he did not respond to calls and a text message sent to his mobile phone, Jain said he was asleep by then. Documents available with the Registrar of Companies show that Rajesh Jain, who started BlueKraft with Hitesh Jain in July 2016, was a director with the company until February 10, 2018. In his resignation letter dated February 8, 2018 available with the RoC, Rajesh Jain said he was unable to continue as director due to “pre-occupation”. On Tuesday, Jain told The Indian Express he had first sent his resignation in October 2017. Since there was no replacement, he had to wait until February 2018, he said. According to whois.com, a domain hosting and registration service provider, http://www.thetruepicture.in was registered in April 2017, much before Jain had quit BlueKraft. BlueKraft is the ‘technology and knowledge partner’ of Exam Warriors, the book authored by Prime Minister Narendra Modi. The book was released on February 3 this year, a week before Jain tendered his resignation.